Google OnHub gives you the capabilities you’re looking for on a WiFi router with a sleek design. This is a router that’s easy to use, and built to be placed front and center in homes (where WiFi works best). You should get this if you simply want fast, reliable WiFi connectivity you never need to worry about, or want to manage every aspect of your home network, Plus, it automatically updates to ensure it always feels new. 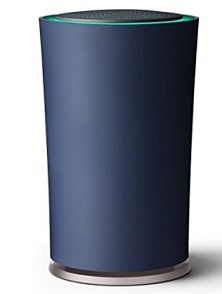 This Google OnHub is designed with you in mind by having mobile app to manage the router. The Google Wifi app makes it easy to set up and manage OnHub from your iPhone or Android device. You can adjust settings, test connections, prioritize devices, and troubleshoot network issues even when you’re on the go. And with the ability to assign guest managers, you can give and receive network help from friends and family, no matter where they are. OnHub regularly performs a Network Check to evaluate the speed of the connection between your devices and the speed delivered by your Internet service provider. This helps you quickly identify anything that might be slowing down your Wi-Fi network. It operates on both 2.4GHz and 5GHz WiFi bands, and it uses automatic band steering to switch devices to whichever band is faster. This boosts connection speed and improves network performance as a whole. Most devices can’t switch automatically, so OnHub does it for them. High traffic on a single channel can slow down WiFi speed, so OnHub also regularly scans the environment and switches to a different channel if it detects interference from other devices. You’ll spend less time waiting and more time streaming, sharing, and downloading. While most routers only have two antennas, OnHub from TP-LINK comes equipped with 13. They’re set in a unique circular pattern that extends optimal Wi-Fi coverage across multiple directions throughout your home. That means you’ll benefit from faster, more stable connections in the house. OnHub now syncs with Philips Hue, the leading dynamic home lighting system. This new feature allows you to change your Philips Hue lights using your wireless network, and control your lighting from any computer, tablet, or mobile device without downloading an app. Type On.Here in any browser to get started. With On.Here you can also easily create and manage guest networks for any devices you want to share, set different levels of access for everyone on those networks, and enable guests to share on your devices. There are two Google OnHub models created by TP-Link and ASUS as shown below, feel free to click on each link to learn more. I very rarely, if ever spend the time to write a review of a product, however after using this router, I felt I had to give you my two cents worth. Very simply put, this router just works. It took me all of literally 4-5 mins to get it up and running and connected to all my devices (9). I live in a modest two story house, roughly 2000 sq ft. My router is located on the bottom floor on one side of the house and my mancave (where I watch most of my tv via roku streaming stick) is on the top floor on the opposite side of the house. I had an Asus A66u router before this that was not allowing me to get a full sharp picture a majority of the time...especially at peak times (6-10p) when traffic is heaviest. I have Comcast by the way...150mb down, 12mb up. In the mancave with my old router I was getting maybe 20-25mb download at off peak times and maybe 8-10 during peak traffic. I now get roughly 55-60mb download at off peak and around 25 mb download at peak times...plenty fast for full sharp streaming. Keep in mind, I do have a baby monitor that does effect my streaming. Don't waste your time testing other routers...I've done it and this comes out on top. Just put your order in and enjoy! This did everything I hoped it would. My desktop PC lives in my office, many many feet away from my internet source with many walls between. It has made my home office a source of frustration and impotence, as the computer and printer struggle for signal. It felt like I had AOL again. NOW I am routinely downloading in the 85-95 Mbps range, and life is good again. Beer is cold, pizza is hot, and birds perch on the top on my monitor to sing the praises of a working wireless network. Seriously the best money I have spent this year by far. So far this is the easiest and fastest router I've ever owned. Set up was a breeze and it's very attractive sitting on the mantle. I had high expectations for this router and so far it has met them all. I would recommend this router to anyone looking for one. There is an app that you download on your phone to set it up and manage the router/connections. Took me minutes to set everything up and it's been running 4 days now with no interruptions to the devices. I will update if there are any issues with the router, no update = no issues. Update: It last almost exactly 1 year then died. I've purchased a lot cheaper that are still working...I don't think I will purchase another at that price for the length of time it lasted. Just ordered this router and I was able to set it up very quickly and the app was very easy to use. I can monitor all my WiFi enabled devices from the app. Works very well with no interruptions. This is the best router I have ever owned. Found it very easy to set-up. Kids now have full coverage in the house. Haven't been kicked off since installing. Return to top of "Google OnHub WiFi Router"!